There aren’t many days out where you can combine touring a historic castle, joining a pirate crew and going on safari. But that’s exactly what we did when we were invited to review Powderham Castle in the South West of England. The 600-year-old family home of the Earls of Devon commands stunning views of the Exe Estuary and has a rich history stretches back to the 1300s. However, as I’ve already eluded to, a day out at Powderham Castle isn’t just about the beautiful historic house and grounds. 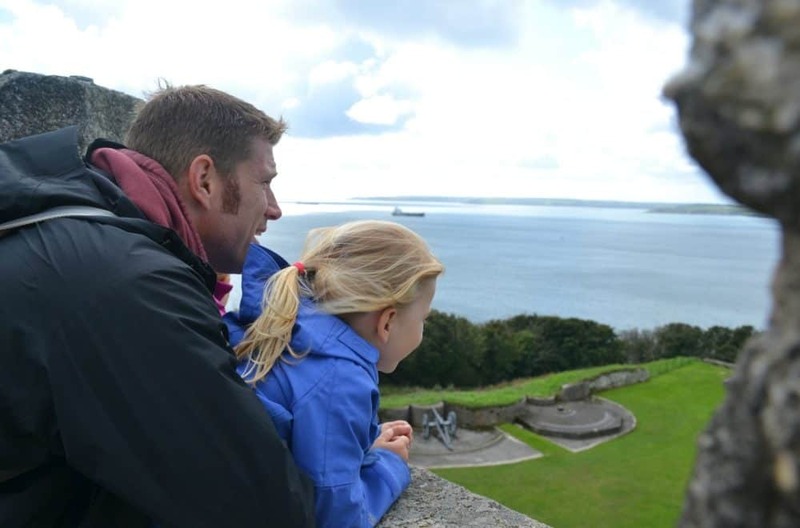 We visited during the school holidays when the castle has a packed programme of activities to entertain the whole family. Here’s a taster of what we managed to squeeze into our visit. 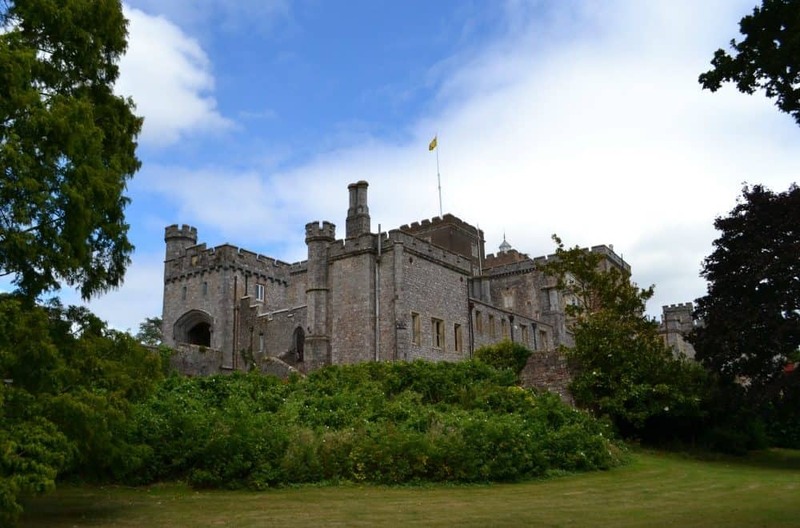 We visited Powderham Castle during a staycation in Devon. We had met up with my parents, Tin Box Grandma and Grandpa, for a caravan holiday in South Devon. We stayed at Dawlish Warren and this popular seaside resort is just 15 minutes down the road from Powderham, so it was the perfect day out for us all. We arrived when the Castle opened at 11am and were given plenty of information about what there was to do by the friendly gate staff. They also gave us tickets for a special themed event at 12.30pm, the 1.45pm deer park safari (additional cost), along with a couple of children’s activity trail sheets. Hidden away from the castle, down a quiet country lane we found the Walled Garden with an extensive play area and pets corner. Tin Box Tot and Baby were particularly keen on the tortoise, which roamed freely around the garden along with chickens of all varieties. In the pens around the garden wall we found ponies, chipmunks, pigs and goats, all keen to see if our girls had anything for them to munch on. We arrived soon after opening time and the pets corner staff were collecting the eggs that had been laid overnight. Tin Box Tot was asked if she’d like to help, which was a lovely touch. She promptly cracked one egg but was pleased when she was able to feed it to the pigs. The girls had just enough time to conquer Fort Courtenay – named after the Earl of Devon’s family – and play on the various pedal-powered tractors in the play area before we headed off for a very important appointment. We were joining a pirate crew! Each summer holiday Powderham hosts themed weeks featuring the Pocketwatch Theatre Company. We visited during Pirates and Mermaids week, but there had also been events with the faerie folk, knights and dragons, the Mad Hatter and Robin Hood during July and August. Lots of families turn up in costumes appropriate to the theme and I was a little disappointed in myself not to have organised outfits for my girls. There are two sessions a day and tickets are allocated on a first come, first served basis. Each session is much more than a performance. We were on our feet, learning how to have a theatrical sword fight and playing pirate games all under the direction of a very convincing Johnny Depp (aka Jonty Depp) look-a-like playing Captain Jack. The swashbuckling fun went a long way above 15-month-old Tin Box Baby’s head but, at three, Tin Box Tot was just about in zone and joined in most of what was happening, if not with a slightly quizzical look on her face. There were kids aged up to 12 getting thoroughly into their pirate roles. While Mr Tin Box and I supervised our little pirates, Tin Box Grandma and Grandpa took a guided tour of Powerham Castle. There are several tours of the house during the day and two hours of ‘free-flow’ at the end of the day in peak season. However, we would recommend you take the tour to get full benefit of your visit. “Throughout the tour, younger members were engrossed in finding objects such as animals and birds, or other features incorporated in the decor. Our guide continually gave assistance in leading them to find the correct objects for the quiz sheet which had been provided as we entered the property. “Our guide kept his descriptions of the various rooms interesting but not too detailed. He made a particular effort to involve all members of the group with comparisons between modern day practice and that of earlier times, often using humour to make the tour fun for everyone as well as keeping the interest of those in the group. I was disappointed that we didn’t also have time to see inside the castle, but that’s one of the benefits of Powderham’s return policy. Once you have paid for your entry, you are welcome to come back and explore the castle, gardens and grounds any time within the next seven days. Straight after the castle tour and our pirate experience, it was time to go on safari. We regrouped and headed for the pick up point. Powderham Castle is home to 500-600 fallow deer depending on the season and you can buy tickets in addition to your entry fee to go on a tractor safari to see them. As the tractor sets off to towards the entrance to the park an audio guide by the Earl of Devon, Charlie, tells you that deer are unpredictable animals and its impossible to say how many you might see. We prepared ourselves to see the odd antler in the distance . Then, only moments later, we were presented with a sea of deer set among the copses and rolling grassland. It was an awesome sight and sadly one that my pictures do not do justice. The tractor safari takes about 45 minutes, during which the Earl continued to share snippets of information about the estate, its history and his personal stories. After the safari we had some time to visit the rose gardens in front of the Castle and appreciate views of the deer park again. During the school holidays the Devon Birds of Prey Centre visits Powderham Castle to show and fly some of its residents. We watched a flying display with Sky the Harris Hawk and Willow the Barn Owl on the north lawn in the afternoon. Despite a breeze, the birds were happy to be flown extremely low and I felt the tips of Sky’s feathers brush my legs and head a couple of times during the display. By this point the Tin Box girls were pooped, so it was time to leave. Powderham really does offer a lot for families to do, especially during the holidays. In fact, there was a bit too much to do. A part from not having time for us all to see the house, we also felt we could have spent longer in the Walled Garden and didn’t even have the chance to visit the American Woodland Garden, complete the nature trail or visit the Nature Nook, Powderham Forge and Country Store selling local produce. That’s why the seven day return policy is such a great idea. If it hadn’t been for us having a lot of other days out planned during our holiday, we would have come back for more. The Courtenay Cafe in the Castle’s courtyard serves up delicious light lunches and home-made cakes. We can particularly recommend their freshly-made sandwiches which were great value for money compared to some other attractions we’ve visited. The deer safari costs an additional £8.50 for a family of four or £2.50 per person. The themed performances during the summer holidays are included in the price of your child’s entrance fee. The gardens and grounds are pushchair friendly. You can also fold up and take pushchairs with you on the safari or leave them by the entrance hut. There’s a baby changing table in the toilets by the cafe. Opening times and events vary, so check out the website ahead of your visit. Disclosure: we were given free entry to Powderham Castle and its attractions for the purposes of an honest review. All opinions are mine and those of my family. This sounds incredible- I can imagine you’d easily spend days exploring here. I’ve never heard of Powderham Castle before, but it looks beautiful! Lots for children to do as well, I’ll have to remember this whenever we’re up in Devon for a mini holiday again. Gorgeous photographs. Sounds as though there’s tons to do! I often feel now that I can’t get round everything I’d like at these attractions. Children go at their own pace, bless them! Rainbowsaretoobeautiful recently posted…Learning through play – how do you play chess? Of course! An out of school holiday visit would probably suit you better. You can explore at your own pace then. Wow that a seriously fun packed day! I would sleep like a log after this never mind my girls. We were pretty shattered by the end of it. I think we took the next day to recover! Jonny Depp was so good. I’ve also seen him do Willy Wonka and he was just as convincing. This is the perfect day out for pirate fans. If you’re in Devon next summer holiday check out their timetable of themed days.